The 2009 Brut Sun Bowl will match-up the Oklahoma Sooners with the Stanford Cardinal on New Year's Eve Day, December 31 in El Paso, Texas. The game is usually played annually at the end of December and features the Pac-10 Conference against either the Big 12 Conference, Big East Conference or the University of Notre Dame (2006 - 2009). Stanford, ranked 19th, is coming off its first winning season since 2001 (!!). This makes it their first bowl appearance since that same year when they had their heart wrenching 24-14 loss to Georgia Tech in the Seattle Bowl. Stanford finished tied for 2nd in the Pac-10 Conference and is the only school to beat league champion Oregon. The 2009 Bowl game will be the 3rd appearance for Stanford. This game will also mark the 5th time the two teams have meet, but the first time in 25 years (!!). The Bowl's selection is done in conjunction with the Gator Bowl. According to that agreement - and during its term - the latter bowl has first choice of which team to choose. Since the Sun Bowl has chosen Big East teams in both 2007 and 2008 (South Florida and Pittsburgh) it will play a Big 12 team in 2009. Starting in 2010, it will match the Pac-10 against a team from the ACC. The inaugural Bowl game was held in 1935, which makes it the 2nd oldest Bowl game behind the Rose Bowl, which started in 1902. The current title sponsor is Brut, which is owned by Helen of Troy Ltd.. Brut is known because it is the brand name for a line of men's grooming and fragrance products. Previous sponsors include John Hancock (1986-1993), Norwest (1996-1998), Wells Fargo (1999-2003), and Vitalis (2004-2005). The latter is also owned by Helen of Troy Ltd..
Game location for this college football bowl game is the Sun Bowl Stadium, which is an outdoor football stadium on the campus of the University of Texas at El Paso. 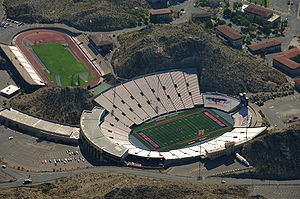 It is also the home to the UTEP Miners who play in the Conference USA (formerly of the WAC). When the stadium was opened in 1963 it was built for 30,000 spectators. In the meantime the seating capacity was expanded to 51,500. Only the grandstands existed in the very beginning and until the expansion. The additional seats were added in the North End Zone and in the East stands. The only place that is left for extra expansion now is the South End Zone. Buy your Brut Sun Bowl Tickets now before it is too late and be one of the tens of thousands enthusiastic fans in this great stadium with David Archuleta performing during the 2009 Bowl's halftime show. Also performing will the two marching bands of the universities participating in the Bowl. A big event linked to the Bowl game is the annual parade, which was always held on New Year's Day from 1936 on. But then in 1978 the event was rescheduled for Thanksgiving Day. With over 250,000 spectators it is one of the biggest events in the area.